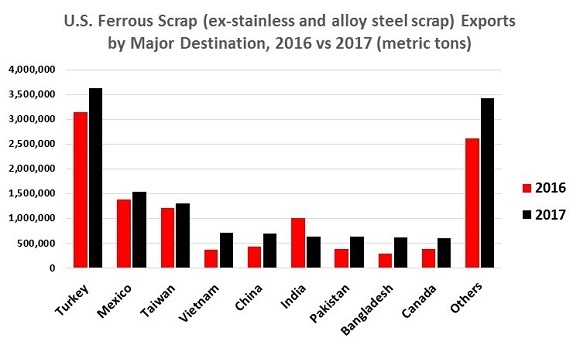 China’s implementation of reduced “carried waste” thresholds for nonferrous scrap starting March 1 remains squarely in focus despite numerous unanswered questions. Among those questions are: what exactly constitutes carried waste; whether a one percent threshold can be effectively (and consistently) implemented; and whether import license cuts will be geared mainly toward mixed metal shipments or for all nonferrous scrap commodities. The difference between scrap and waste remains a critical distinction. As was brought up by a former ISRI Chair at the ISRI Trade Committee meeting in late January, a shipment of No. 2 copper that is 96 percent copper does not mean the remaining 4 percent is waste as it very likely contains other valuable metals. 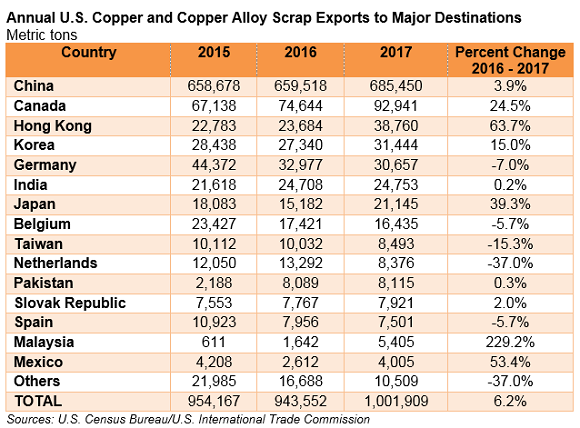 Although U.S. copper and copper alloy scrap exports to mainland China did trail off in the 4th quarter of 2017 (down 10 percent year-on-year), for 2017 as a whole shipments to China advanced nearly 4 percent. 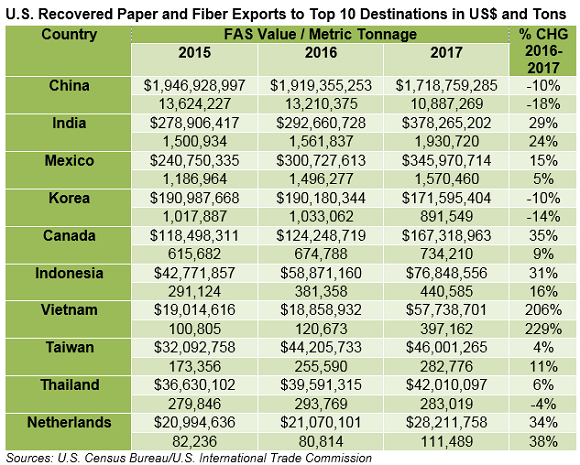 Overseas demand also improved in Hong Kong, Korea, Japan, Malaysia, Canada, and Mexico last year, helping to boost U.S. copper scrap exports 6.2% in 2017 and above the 1 million ton mark for the first time since 2014 according to the latest Census Bureau trade data. 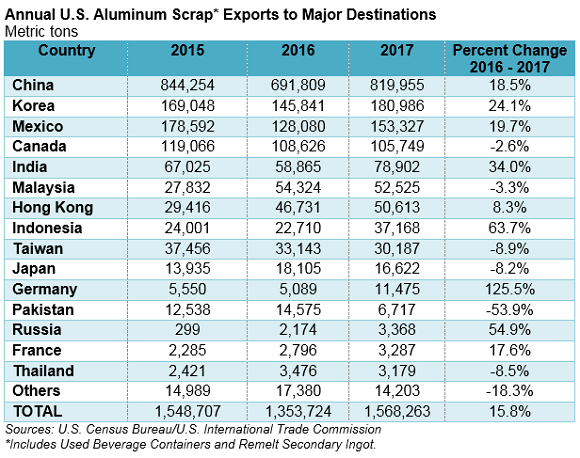 Not surprisingly, U.S. plastic scrap exports were hit hardest by the Chinese import restrictions announced last year. 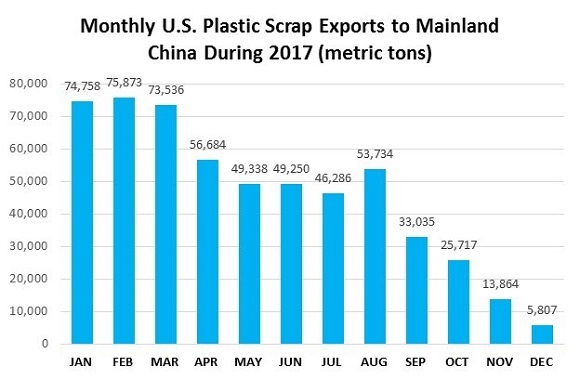 Plastic scrap export sales to mainland China and Hong Kong dropped 32% and 38%, respectively, in dollar terms in 2017. 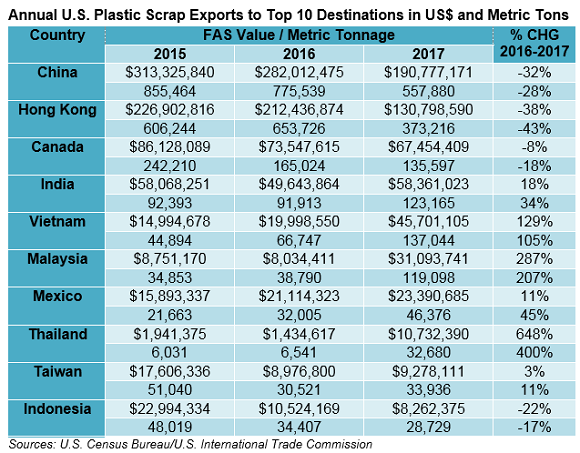 As Chinese plastic scrap purchases plummeted, the total volume of U.S. plastic scrap exports fell 14 percent to 1.67 million metric tons, the lowest level since 2008.